1. 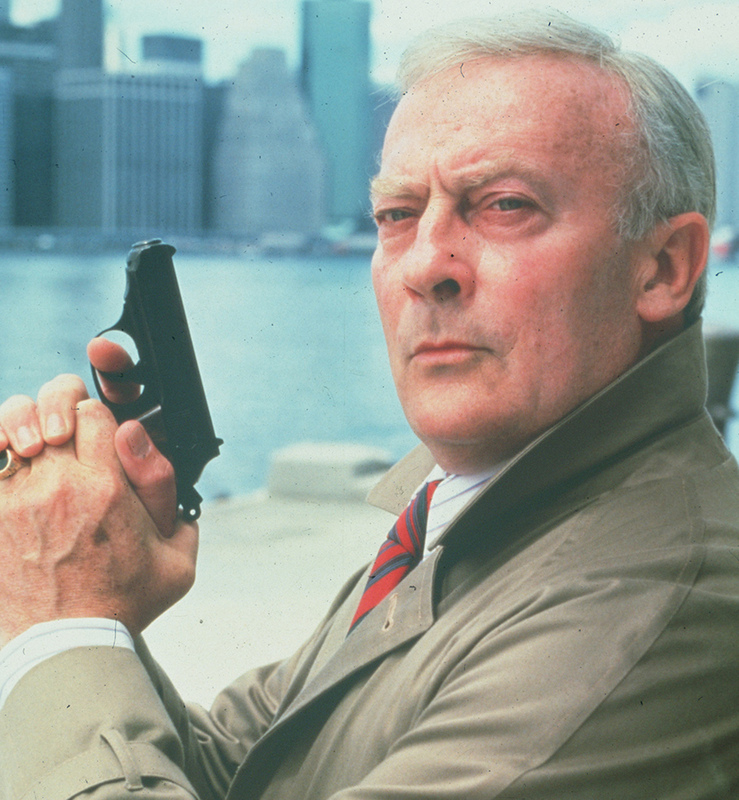 Edward Woodward had previously portrayed a character like McCall. A generation before playing a secret agent troubled by past misdeeds on American TV, Woodward played a secret agent troubled by past misdeeds on British TV. Between 1967 and 1972, 43 episodes of Callan were produced for Thames Television in the U.K. with Woodward in the title role. He returned as David Callan for a 1974 feature film known in some territories as The Neutralizer. 2. The co-creator left after the pilot, then came back 30 years later. The Equalizer was created by writer/producer Michael Sloan and Universal executive Richard Lindheim and pitched as a contemporary update of the 1950s gunman-for-hire series Have Gun – Will Travel, which also aired on CBS. Sloan wrote the pilot but was not involved with the series. The year after the show ended he married actress Melissa Sue Anderson, who had appeared in four episodes as the goddaughter of Control, McCall’s former boss. Sloan returned to the franchise in 2014 with a novel that updated McCall to present day New York. 3. Edward Woodward almost didn’t get the job. Casting Woodward, then largely unknown to American audiences, was “one of the great battles of the series,” writer/producer Coleman Luck said in a documentary produced for the DVD release. Universal wanted Woodward, but the network needed convincing, so the BAFTA award-winning actor submitted an audition video. Woodward had first come to Sloan’s attention when the writer/producer cast him in Hunted, a 1972 short Sloan later adapted for an episode of the rebooted Alfred Hitchcock Presents in 1988. 4. There was a behind-the-scenes shakeup after season one. Following a first season in which The Equalizer ranked in the bottom 20 of the Nielsen ratings, show runner Joel Surnow – who had written or co-written nine of the first 22 episodes – was reassigned. He was replaced by Ed Waters for season two, and the series jumped to number 37. But shed no tear for Surnow, who went on to create 24 and the TV version of La Femme Nikita, in which he cast Woodward as the title character’s father, a reluctant former agent. 5. The Equalizer and Magnum, P.I. almost crossed over. After season one, Universal execs requested that McCall team up with Thomas Magnum, the mustachioed private investigator played by Tom Selleck on CBS’s venerable Magnum, P.I., also a Universal production. The Equalizer writer/producer Coleman Luck wrote a script for the crossover, which was eventually scrapped and re-written as Beyond Control, the thirteenth episode in season two. While we never got to see Robert McCall and Jonathan Quayle Higgins III (John Hillerman) trade barbs on the beach in Hawaii, Woodward and Hillerman would team up in Victorian Era England for the 1990 CBS TV movie Hands of a Murderer as Sherlock Holmes and Dr. Watson. 6. McCall’s son was The Karate Kid bad guy. As Daniel-san’s rival Johnny in John G. Avildsen’s The Karate Kid, William Zabka was one of the most memorably hateable movie villains of the 1980s. A year later, Zabka was cast in a very different role: Scott, the sensitive son McCall had left behind. Robert and Scott’s tentative, often combative relationship humanized the show’s title character and Woodward and Zabka share some of the series’ most emotionally resonant scenes. 7. A member of The Police wrote the music. The series theme and all the incidental music for the first two seasons was composed by Police drummer (and co-founder) Stewart Copeland. Copeland even released a soundtrack album of his infectiously percussive underscores called “The Equalizer and other Cliff Hangers” in 1988. He left in the middle of the third season after scoring 51 episodes, but his electronic Equalizer style lived on in scores for films like Oliver Stone’s Talk Radio (1988). 8. Edward Woodward had a heart attack in the middle of the series. Woodward, then 57, was stricken with a heart attack during the break between seasons two and three, and doctors insisted on a severely diminished work schedule of one day per week upon his return. Producers and writers scrambled to cover the star’s absence with a story arc in which McCall is abducted, and big name guest stars like Robert Mitchum and Richard Jordan filled in. 9. Jessica Fletcher killed The Equalizer. Angela Lansbury’s five-year contract on Murder She Wrote expired after the fourth season of The Equalizer, and Universal and CBS went through a “brutal” negotiation period, according to Equalizer producer Coleman Luck. Lansbury emerged with a new deal to keep her top-rated show on the air, but CBS then cancelled The Equalizer, which had previously been renewed for a fifth season. “It was because of a horrible relationship between Universal and CBS at that time,” Luck said. “The whole thing was a political game.” It was an appropriately backstabby ending after 88 episodes of shadowy intrigue. 10. The Equalizer is still in business. Happily, The Equalizer returned in 2014 in a successful feature film reboot starring Denzel Washington as McCall, with a sequel expected next year. Unhappily, they changed pretty much everything from the TV show, including moving the setting from New York to Boston. But they got at least one thing right (in addition to the casting of Denzel): the film ends with McCall placing The Equalizer’s iconic classified ad for prospective clients. Only this time it’s on Craigslist.